Tight end Lance Kendricks has only seven catches through five games. 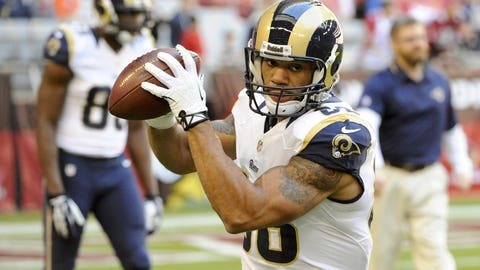 St. Louis Rams starting tight end Lance Kendricks underwent surgery Monday to repair a torn ligament in his finger. Coach Jeff Fisher said Kendricks has been dealing with the injury since the start of the season but the team elected to wait for the bye week for him to have the procedure. Tight end Justice Cunningham was signed off the practice squad Thursday in case Kendricks is not ready to return in Week 7. One reason for Cunningham promotion is TE Lance Kendricks underwent surgery on finger earlier this week. May not be ready for Cleveland. "Courageous effort since the Seattle game since the injury," Fisher said of Kendricks per the St. Louis Post-Dispatch. "He’ll be questionable for Cleveland, so we needed to get Justice up on the roster. Justice has earned the right and so we’ll be fine until Lance is ready to come back. And he may be back for Cleveland, we just don’t know." Kendricks has only seven receptions for 85 yards on the season and has not surpassed 16 yards receiving in each of the past four games. With Cunningham promoted, St. Louis re-signed running back Trey Watts to the practice squad. Watts was released earlier in the week but was expected to rejoin the club.